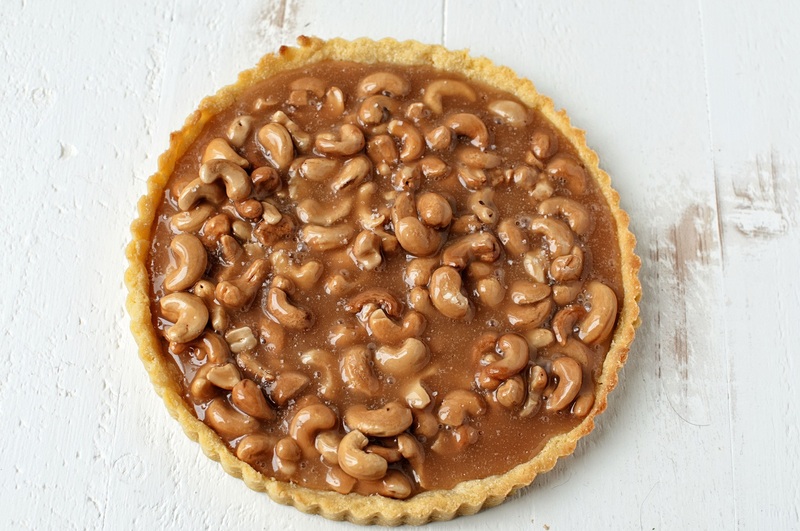 Salted Caramel Cashew Tart: A buttery sweet tart shell filled with rich caramel and salted cashews for the ultimate salty sweet combo. The American people voted and picked Hillary via the popular vote. The American political system picked Trump via the Electoral College. I have said on here before that I was for neither candidate…though I will say I am strongly concerned about the loss of some of our civil liberties that could be coming. I then donated to the causes that are near and dear to my heart. Then I donated to the causes that I’m concerned we may lose with our new president elect. Here’s a link for those who might want to donate to certain causes. Just as President Obama and Hillary Clinton said, I am wishing our new President the best. I’m really not interested in seeing the country I live in fail. That being said I won’t just roll over and agree with all that is happening if I feel injustice is happening. There you go…that’s as political as I’m going to get. Now on to this tart. It’s easy to make. It has the consistency of a Snickers bar on top of shortbread…minus the chocolate and with cashews of course. It’s not a runny caramel so you can cut off a wedge of the tart and carry it in your hands…I know because I did it. 🙂 It’s the great combo of salty and sweet and it’s highly addicting. Using a pastry blender, cut butter into flour mixture until mixture resembles coarse meal. You can also use a food processor and pulse. Knead lightly until dough comes together or use the pulse setting. On a well-floured surface, roll into a 10-inch circle. Place circle of dough into a tart pan with a removable bottom. Press dough against sides of the pan. Trim away and discard excess dough. Chill shells until firm, 15 minutes. Bake pastry shell 15-20 minutes; cool. Place sugar, water, and corn syrup in a small skillet over medium heat. Swirl pan lightly to mix. Simmer mixture until it turns the color of iced tea, about 5 minutes. Remove caramel from heat; stir in the butter. Add cream; stir until caramel is smooth. 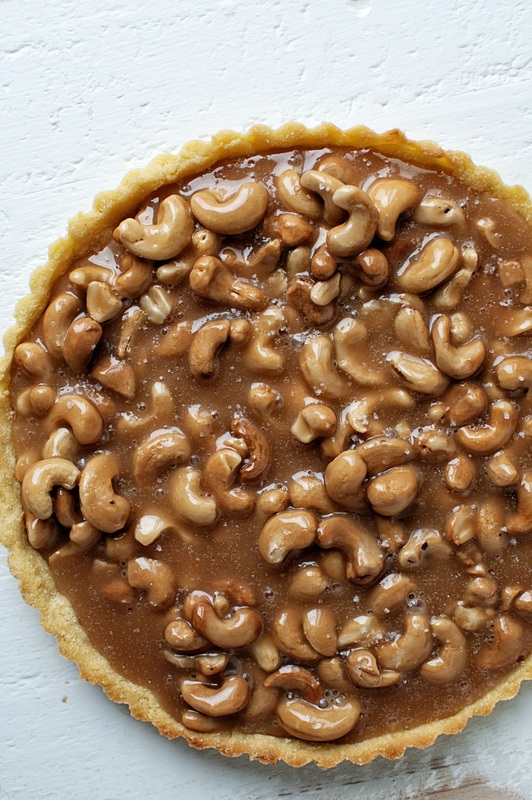 Add cashews; pour caramel filling evenly into baked tart shells. Sprinkle with extra sea salt if desired. Allow tart to cool completely. It’s going to have a candy bar texture. You can cut it easily but the caramel will not run…will be more like the inside of a Snickers bar. I love your outlook and response. I also love salted caramel and cashews but have never tried them together! I think this would be a nice alternative to pumpkin pie at Thanksgiving. I almost always serve a nut tart at the holidays as an alternative…always gets eaten! Absolutely decadent! This would probably work well with other types of nuts or combinations of nuts. This looks so good. I love cashews, so I’m definitely going to try this. And thank you for the list of organizations that could use help after last Tuesday!! 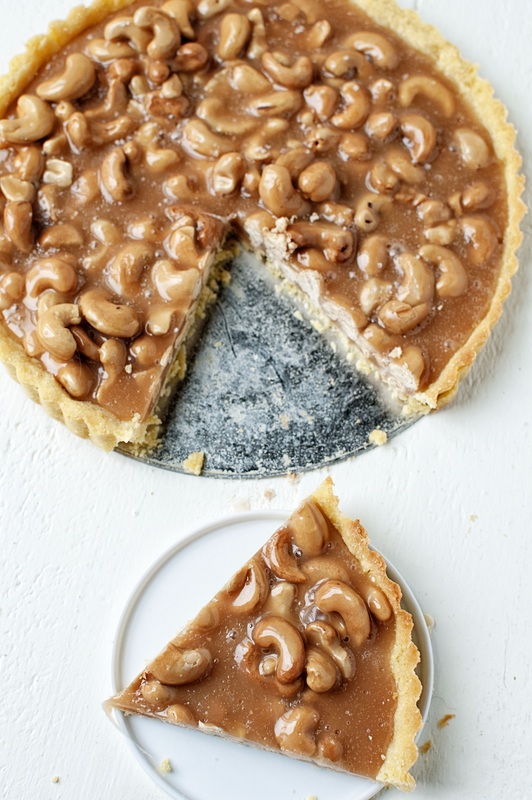 Using cashews in a tart is a fantastic idea! I feel like people don’t use them enough and they are so good! This looks so yummy. Worth trying. Thanks for sharing. How did I miss this last year? It looks divine! Quick question, the instructions say to add the table salt to the crust, but it isn’t in the ingredient list, or am I just missing it? Fixed now…it was just a pinch so it doesn’t matter that much.